FilmDayton has launched their own website, Check it out for the most current happenings in the Dayton Film scene! You can also find us on Facebook. The next Film Connections meeting will be Tues, June 30th from7-9pm at ThinkTV. Details to come soon. If you’ve got an interest in film, please join us! Dayton area filmmakers serve up something for everyone’s holiday film feast. Vampires and politics, dogs and cars, codebreakers and victims of unjust incarceration, airplanes and pumpkinheads, Hollywood stars and hometown stars are featured in this year’s collection of regionally connected film DVDs being promoted by Film Dayton as great gifts for the upcoming holidays. No collection of Dayton-related film DVDs is complete, because every year the region contributes new locations, writers, talent, crew, music, post production technicians, investors, and more, to create a diverse assortment of new films. From thoughtful to frightful, regional films showcase the creativity of our region. OUR MISSION: Fostering the growth of our regional film industry and audience. 10/28 – 2nd Film Connections Meeting held– had about 30 people attending and saw a wide range of really interesting work – David Spyridon and his composer from Greene Glen productions demoed some of the scoring they have done for films and talked about their arranging/composing/recording capabilities. Two students from WSU film showed part of a documentary on Tough Man fighting, and Marisha showed two student films from Scotland as well as the trailer for a British gangster film that she produced. The first “Film Connections” meeting was held 9/23 and a group of about 30 people, including film makers, students, film buffs and a sprinkling of business people. 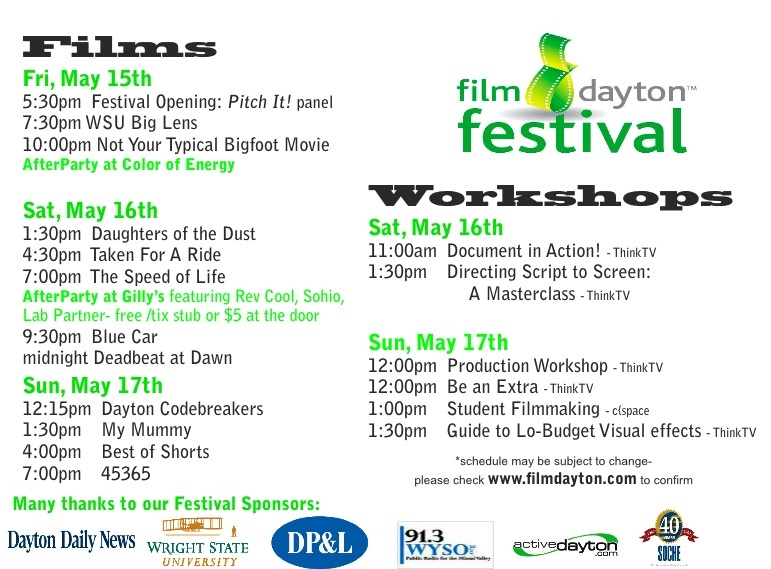 The meeting began with the premiere of the FilmDayton logo prototype, as revealed by Bill Reiger from Nova Creative. Then local film maker Steve Bognar kicked the night off by sharing his recent experience at the independent film festival in NYC, followed by him showing some clips from his latest documentary-in-progress. He also showed a brief skate board film, created by a Yellow Springs native, too shy to attend and invited Davie Powers to show his music video Crazy Loop, which was submitted to the national 2nd Numa contest and won $10,000. Ann Rotolante showed a trailer for the locally filmed True Nature. There were questions, announcements, and lots of conversation. Someone proposed a Tuesday Night movie club – in fact a group left to see the 9:40 PM showing at the Neon. People stayed around and talked until 9:30 PM, and various people volunteered to help. There were new faces and old faces, including Dennis Greene, Beth Duke et al, and J.T. Anderson. There were also film students from WSU and UD. “Ropewalk: A Cordage Engineer’s Journey Through History”, has won an Award of Excellence in History Outreach from the Ohio Association of Historical Societies and Museums (OAHSM). Dayton Connection: Ropewalk, a one-hour documentary film by Ohio filmmaker Steve Fetsch, explores rope’s ancient beginnings, world history and future possibilities through interviews with local resident Bill Hagenbuch, retired president and chief engineer of Xenia’s Hooven & Allison Co, one of the country’s last natural-fiber ropemaking companies, as well as archival footage that illustrates the local cordage industry’s role in agriculture, industry, and world history. Ropewalk was produced by the Engineers Club of Dayton Foundation in cooperation with the Cordage Institute. The OAHSM History Outreach Awards, presented annually since 1959, recognize projects that have educational content, that have contributed to the promotion and understanding of local and state history, and that have had an impact on the community. The award will be presented to the Engineers Club of Dayton Foundation at the Ohio Historical Center in Columbus on October 4. Burn After Reading, a dark spy-comedy from Academy Award winners Joel and Ethan Coen. A disk containing the memoirs of a CIA agent ends up in the hands of two unscrupulous gym employees who attempt to sell it. Starring Brad Pitt, George Clooney, Frances McDormand & John Malkovich. Short film titled “Y Not” to debut at Chicago International REEL Shorts Fest running Sept 12 through the 14th. “Y Not” tells the story of a successful realtor who takes a moment from her busy life to help a complete stranger. But in a comedic and unexpected way, the realtor finds their lives are more connected than it seems. 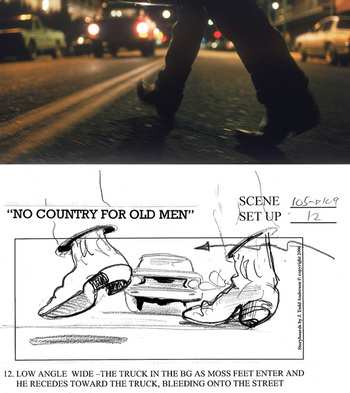 Dayton Connection: Shot entirely in the Dayton area using Dayton-area actors and crew, ““Y Not”, is Derek W Beck’s directorial debut, shot in Dayton while off-duty from his assignment at Wright-Patterson AFB.